I am writing this post as I’m en route to Kansas City to finish up some work projects and to visit family. We’ve found ourselves traveling a lot recently between our new home state of Oregon and our former home state Kansas. Sometimes I can’t make up my mind if I’m an Oregonian or a Kansan. I decided this morning I can be both. Life has been good lately. I’ve started a personal Instagram account (@danainreallife) to share more about things outside of food (like travel, marriage, and natural beauty). So if you’re wanting more behind-the-scenes peeks at our everyday life, you can follow along there. 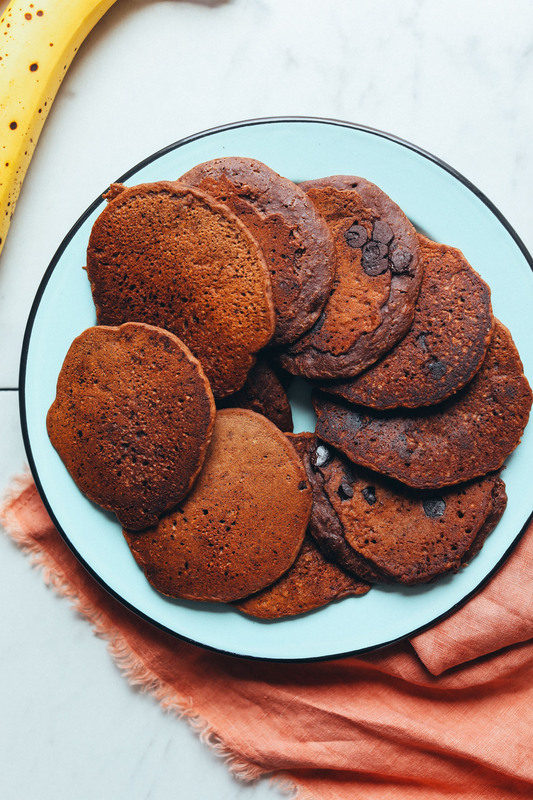 Otherwise, keep it parked here for a serious dose of plant-based goodness, like these Vegan Gluten-Free Chocolate Chocolate Chip Pancakes! This recipe is inspired by and adapted from my Life-Changing Banana Walnut Pancakes! Only this time, I went all in with a double dose of chocolate: cocoa-infused batter speckled with semisweet chocolate chips! Serious swoon. In just 20 minutes, you’ll have fluffy, tender, wholesome pancakes that just happen to taste like chocolate cake on your hands. Does life get any better? Now, for toppings? 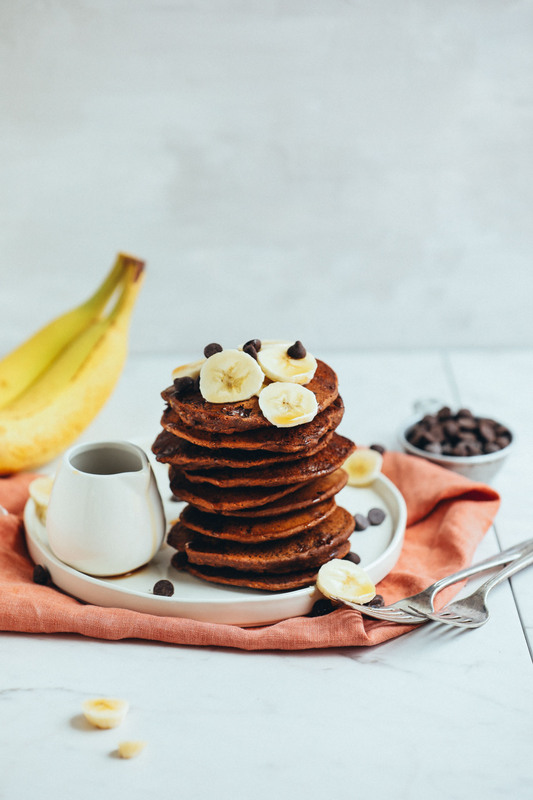 While these pancakes are delicious on their own, take them to the next level with things like maple syrup, chocolate chips, banana, and coconut butter! These would also be insane with peanut butter (tested and approved). These would make the perfect lazy weekend breakfast! OR make a batch ahead of time, freeze them, and then pop them into the toaster (yes, it’s my favorite frozen pancake + waffle hack) for a quick and easy breakfast during the week. Love pancakes? 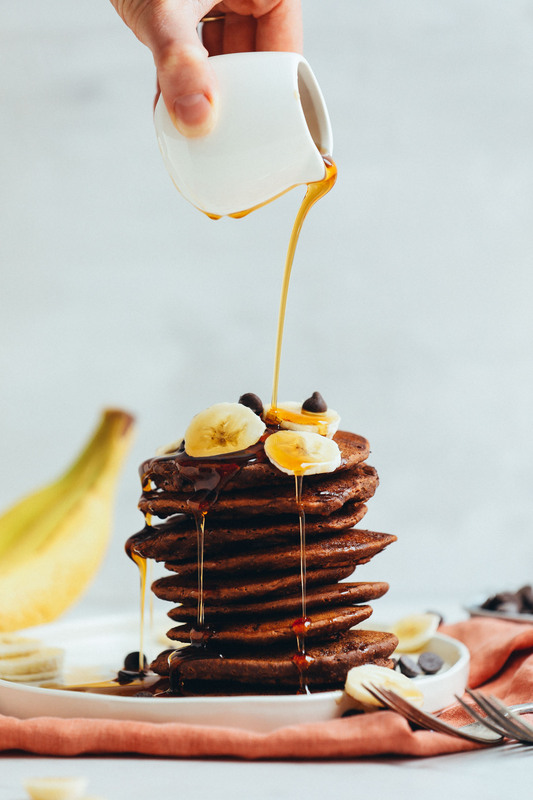 Try our Chocolate Chip Oatmeal Cookie Pancakes, Oreo Pancakes, Whole-Grain Vegan Pancakes, Blueberry Muffin Pancakes, Life-Changing Banana Walnut Pancakes, Vegan Carrot Coconut Pancakes, and Toasted Coconut Pancakes. 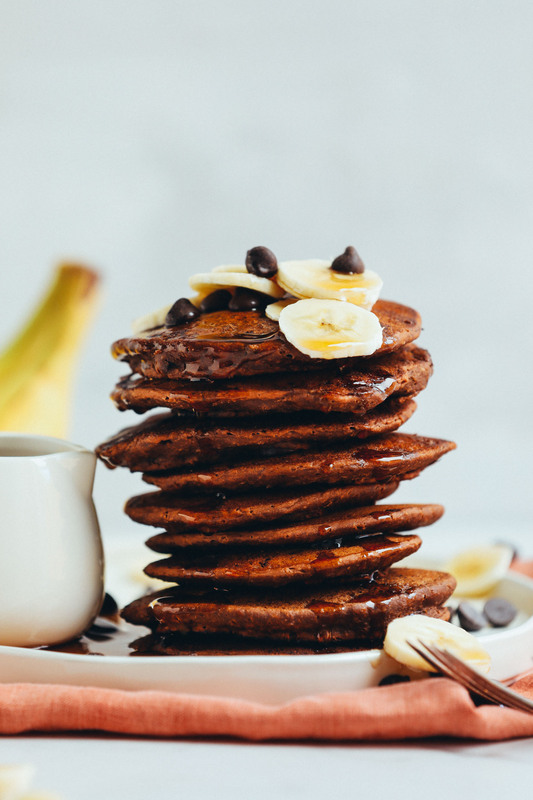 Fluffy chocolate chocolate chip pancakes made in 20 minutes with wholesome ingredients. The perfect vegan, gluten-free, naturally sweetened breakfast! 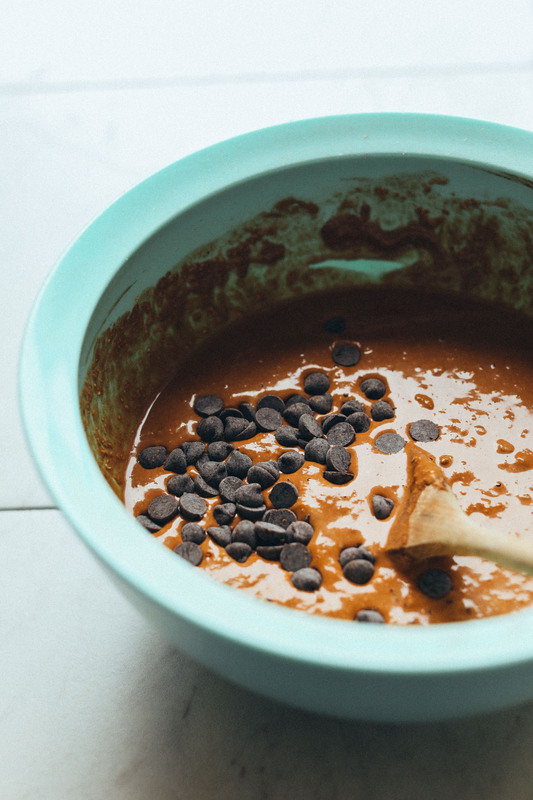 To a large bowl, add oat flour, gluten-free flour, almond flour, cocoa powder, baking powder, and salt. Whisk to combine and set aside. To a separate mixing bowl, add banana and mash. Then add melted coconut oil, vanilla extract (optional), and maple syrup and whisk to combine. Then add non-dairy milk and whisk to combine. If the coconut oil hardens or clumps, it's not a big deal. You can microwave (for 45 seconds - 1 minute) to remelt - otherwise proceed. Add the wet ingredients to the dry ingredients and gently fold everything together. Then add the chocolate chips (see photo) and gently fold/mix until the batter is well combined. It should be thick but pourable/scoopable. If too thin, add more gluten-free or almond flour. If too thick, thin with a little non-dairy milk. Once hot, spoon 1/4 - 1/3 cup of the batter onto skillet. Cook until surface of pancakes have some bubbles and the edges appear dry (~2 minutes). Carefully flip pancakes and cook until browned on the underside (~2 minutes more). Transfer cooked pancakes to a baking sheet or plate and keep warm in a 200-degree F (94 C) oven. Continue cooking until all batter is used up - about 12 pancakes (as original recipe is written). These pancakes are delicious on their own, but they're amplified with toppings (see options above). Store cooled leftover pancakes (without toppings) in a container separated with wax or parchment paper to prevent sticking. Will keep in the refrigerator up to 4 days or in the freezer up to 1 month. Reheat in the toaster oven or oven until hot. *If you can't tolerate oats, you can try subbing a blend of gluten-free flour and almond flour, but I haven't tested it that way and can't guarantee the results. *If nut-free, sub the almond milk for rice or light coconut milk. And sub the almond flour for additional gluten-free flour blend. *If oil-free, try subbing the oil with applesauce or 1 Tbsp (15 g) nut butter. *Nutrition information is a rough estimate for 1 of 12 pancakes without toppings. 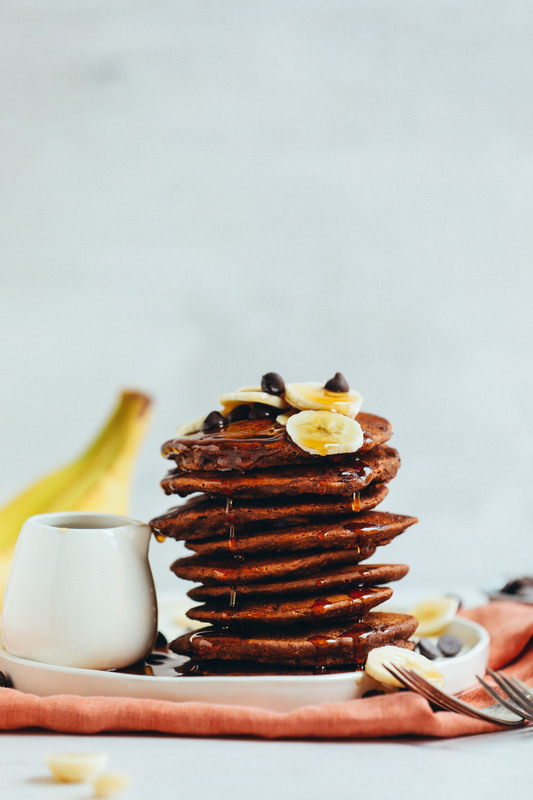 *These pancakes are adapted from the Life Changing Banana Walnut Pancakes. Love it. I finally found a recipe that worked. I used apple sauce instead of the banana. I made these this morning and they worked out great! perfectly chocolatey and not too sweet. Had to add a little extra almond milk to thin it out. Kids loved it. I’ll be making these again! What happened to @danainreallife? The link doesn’t seem to be working. Hi Dana! I made these this morning as I was craving some chocolate indulgence and they hit the spot. So delicious! I used extra almond flour in lieu of the oat flour. The banana flavor was a nice, subtle flavor. I ate some with syrup and some without. Whole fam love ’em-thanks! I used coconut flour insetad of almond meal and the results were a yummy american style thick pancake. The best topping I found was apricot jam, peanut butter made them too heavy for the changes I made. For chocolate chips I used sweet williams (gltuen free + vegan and cheap @ coles) and I used a high protein soy milk that made even just one pancake filling. Thanks again for delish recipes!! Yay! Thanks for sharing your changes, Sophie! We’re glad you enjoyed them! 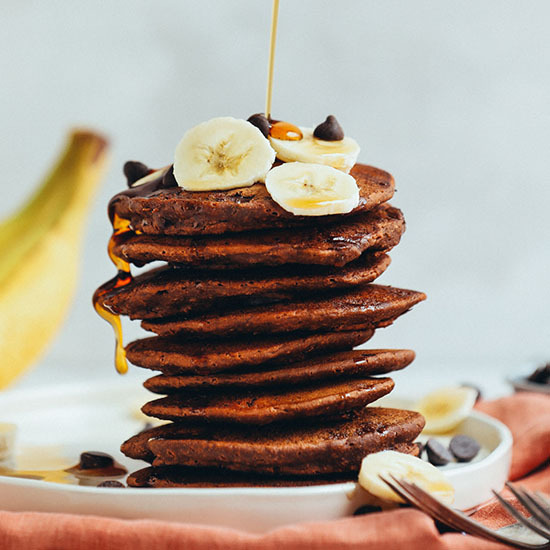 As a new vegan, I was looking for ways to get more protein into my breakfasts after workouts and subbed in chocolate protein powder over the cocoa. It worked beautifully! Really loved these and will definitely make again. These are our new favorite pancakes! Thank you!! Just perfect, not too sweet, just right with a little “butter”. These pancakes are a weekend favorite, even for my husband who lives on junk food. This is one recipe the whole family enjoys. Thank you. I used 1/2 oat flour, 1/2 all purpose as a flour combination, and subbed the coconut oil for apple sauce, and they turned out spectacular. Would recommend this recipe to everyone who eats food. Thanks for, yet again, another staple I can add to my weekly routine. You are a goddess! Thank you for the recipe!! I just made this recipe, with a few modifications, using what I had in the house and they were delicious!! I used coconut manna instead of the oil, coconut flour in place of the almond flour and coconut milk. I was concerned the chocolate chips might burn in the pan, so I decided to make muffins instead. We eat eggs, so I added 3 seperated eggs and folded in the beaten whites at the end. I will definitely make this recipe again. Even my 13 year old son enjoyed them!! ? I made these for breakfast this morning for me and my two year old. They were a hit! I ran out of oats and coconut oil, so I replaced those with organic Buckwheat flour and canola oil. I did have to add a couple tablespoons of nut milk, but they still turned out great. Thank you! Made these tonight for dinner and they were a hit! Served with sliced banana, shredded coconut, vegan butter and maple syrup- delicious!! Thanks so much, love your insta! This was a yummy treat for breakfast. A bit bland, so I added about a teaspoon or two of coconut sugar, and topped with some powdered sugar and strawberries. I blended my oats in my Ninja and we’re not gluten free, and didn’t have the gluten free blend on hand, so subbed in unbleached all purpose flour for the gluten free flour amount and used regular semi-sweet chocolate chips. The texture was fluffy and tender. I enjoyed them. I’m not sure how to add a pic, but I have one. ? Thanks for the feedback, Elisa! Glad you enjoyed these. Hey Dana! Thank you so much for this recipe, it was absolutely the motivation I needed to get out of bed! I live in Lebanon at the moment, where treats like Maple Syrup are pretty expensive, so I sub with Carub Molasses, it’s amazing… I don’t know if you’ve ever had it but it’s naturally sweet and almost chocolatey in taste. I used a few tablespoons as sweetener and as a topping. I highly recommend it! Plus it’s 100% vegan friendly! I also wanted to say a more general thank you for your beautiful recipes! I just transitioned to vegetarianism and you protein-rich no-fuss no-time recipes saved me from starving myself more during the month of Ramadan! Your cocoa energy balls have become a staple in my diet, I’m either making them, eating them or talking about eating them. Thanks for your great work! Keep on going! Lovely! thanks for sharing, Soumia! I just made these and they’re absolutely divine. My entire family loved them! Yay! Thanks for sharing, Cristina! Next time can you please leave a rating? It’s super helpful for us and other readers! Oh, that might work! Let me know if you give it a try. You’ll likely have to compensate for sweetness. I love love almond flour pancakes, very similar to these, and when I don’t have a ripe banana on hand I use about 3/4 cup pumpkin puree or mashed leftover sweet potatoe…..they all go great with the same “apple-pie spices”! Because we’re all fine with eggs in my house I prefer to use 2-3 in this recipe; I just got tired of trying to flip a too-flimsy “cake”…sorry! I also whip the whites till stiff, fold them in last, and that keeps them fluffy! I only rated the 4 for the lack of body without eggs; the flavour is great! These pancakes look amazing! I hope you have an amazing trip in Kansas City and all is well. I’ll have to check out your personal Instagram account too! Hi, looks so good!! Do these taste like banana at all? If so, do I need to add the banana? I like bananas but not in my food. Hmm, it’s there but subtle. You could try subbing more applesauce maybe? Could you use cocoa powder instead? Thank you so much for sharing this recipe!! I have been on this pancake kick all week long, so this is perfect. I can’t wait to try this out! P.S. your banana nut muffin pancake recipe is bomb, so I’m certain that this will be just as amazing. ? I made these this morning using the applesauce – delicious! They were thick, tasty, and very filling. Thank you, Dana, for another great recipe!